In Digital Rhetoric: Theory, Method, Practice (2015), Douglas Eyman conceptualized digital rhetoric as an emerging field. 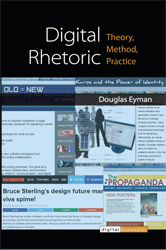 Part of Eyman’s project was to define and locate digital rhetoric as a study and practice situated at the nexus of interdisciplinary fields such as digital literacy, visual rhetoric, new media, human-computer interaction, and critical code studies. A further aim was to position the endeavor at the intersections of theory, method, and practice, each of which comprises a chapter. Each strand interwove insights into the ways in which digital spaces complicate traditional conceptions of rhetoric. As a production of digital rhetoric, the book illustrates connections between content and format. For instance, reflecting the notion that hypertextuality invites intertextuality, the digital version of the text incorporates hyperlinks to each section of the book and to course syllabi, scholarly webtexts, textual appropriation and remix projects, as well as collaborative websites on digital rhetoric that provide informative resources to scholars and practitioners of the field. 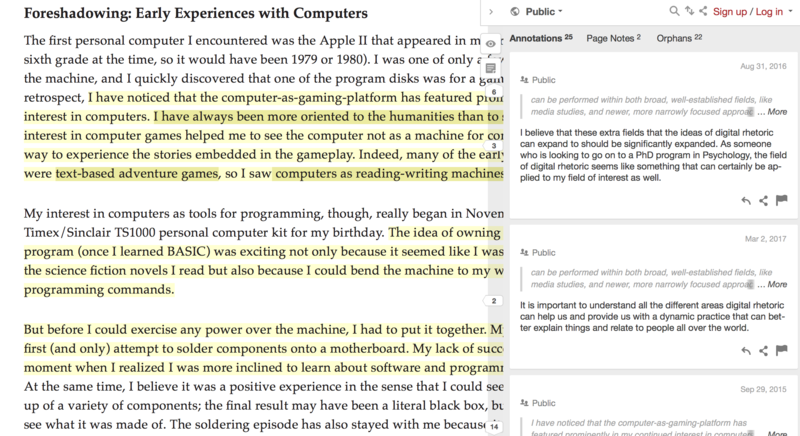 In addition, the digital book invites interactivity through a social annotation tool, as readers who log in are able to highlight and annotate the text as well as view other users’ markups and comments. Published by the University of Michigan Press under the imprint digitalculturebooks, the book offers an essential contribution to digital rhetoric not only by relating its past histories, mapping its present positionalities, and envisioning its future directions, but by articulating its larger significance as a “field in its own right” (Eyman, p. 45). Emerging and established digital rhetoric scholars and practitioners, as well as scholars of rhetoric and composition, writing studies and others who are interested in digital spaces, will find the book especially relevant for gaining a theoretical understanding of the field's scholarship and methodologies. In addition, instructors who wish to integrate digital rhetoric and multimodal composition into the classroom will find useful pedagogical resources, including syllabi, readings, and assignments collected from courses at various institutions, which offer complementary approaches to teaching its analysis and production. In essence, the three-fold structure of theory, method, and practice will draw in audiences with interests in each of these threads. In this review, I present an overview and implications of each chapter, followed by a video screencast on annotating the digital book. Under the Introduction dropdown menu, I also include a reflection on composing the webtext. Continue to Chapter One Overview. In order to invite multiple possible nonlinear navigation pathways, I offer below an alternative pathway organized according to the overviews and implications. I offer overviews for those who are primarily interested in the chapters' content and implications for those who are interested in the review.